The Grup Baucells Alimentació meat business will connect its production centre in Vic (Province of Barcelona) to some freezer tunnels through an automatic pallet conveyor circuit with roller conveyors and a pallet lift. The two buildings are separated by a two-way public street, which is why the company had to construct a raised, closed in passageway to join them. Mecalux will install the conveyors that flow through the tunnel, as well as the pallet lift that will ensure a constant flow of goods between the installations. 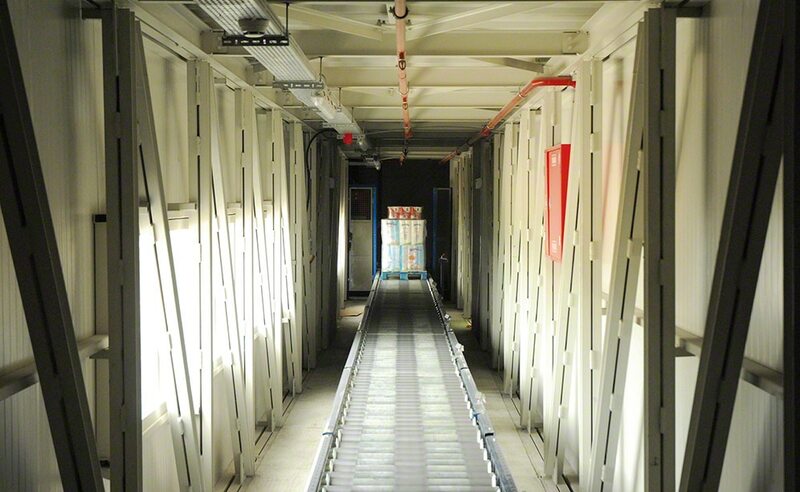 The sequential accumulation roller conveyors will move the goods from production up to the freezer tunnel. By having fully-automated operations, the system requires minimal intervention by personnel (who only need to insert and extract pallet from the circuit), which will eliminate errors resulting from manual management. Founded in 1958, Grup Baucells Alimentació is a company which sells pork cuts. From its plant in Vic (a few kilometres from Barcelona), it produces more than 90,000 tonnes of meat product a year that is distributed in 50 countries. Meat butchering and quartering can vary from country to country. As such, the company has a team who specialises in which meat cutting and deboning techniques suit each national region to produce high-quality cuts of meat.